A 62-year-old child psychiatrist has become the oldest woman in Britain to have a baby. Patricia Rashbrook of Lewes, East Sussex, and her 6lb 10oz boy, nicknamed JJ, were said to be doing well by her husband John Farrant, 60. Critics said it was selfish to have a baby at their age, but they said they were confident of meeting his needs. They travelled to the former Soviet Union to get fertility treatment from Italian doctor Severino Antinori. Dr Rashbrook already has three grown-up children - aged 26, 22 and 18 - from her first marriage, but her husband has become a father for the first time. JJ was conceived through IVF using a donor egg and was the result of the couple's fifth and final attempt at the process, which cost £10,000. Dr Peter Bowens Simkins, clinical director of the Cromwell IVF and Fertility Centre, in Swansea, said he and others in his profession considered the birth unacceptable. "I don't think that it is a responsible decision on her part and I don't think it is in the best interests of the child to have a mother who, when he or she is taking say GCSEs, the mother is going to be in her late 70s," he said. "As long as people have the freedom and movement there's nothing one can do to stop that, but in this country I think it's highly unlikely that we'll see it happening for many years." But Dr Rashbrook told the Daily Mail she felt "it was the right thing to do" and she did not feel too old to have a baby. She said: "We would not have gone ahead if we'd felt we would not be good enough parents. "We are both extremely healthy and I have always looked and felt very young, but nevertheless we have younger friends with children who have agreed to act as surrogate parents should anything happen to us. "What is important in parenting is not how old you are, but whether you are meeting all the child's needs and we are very confident about doing that." Mr Farrant said the couple had received more than 200 letters, cards and e-mails of goodwill from members of the public and only one, unsigned letter that was "negative in tone". Speaking on the steps of the couple's four-storey townhouse on Saturday he said: "I'm happy, we are happy." Dressed in shorts, sandals and a T-shirt, he said his wife and JJ had no immediate plans to leave the house. Dr Rashbrook described the birth as "absolutely wonderful"
"He's had enough excitement in the last couple of days," he said. The couple said the baby had been nicknamed JJ early in the pregnancy, but were yet to decide what his full name would be. Dr Rashbrook described her son, who was delivered by Caesarean section at Sussex County Hospital, in Brighton, on Wednesday, as "adorable", adding: "Having been through so much to have him, we are overjoyed. "His birth was absolutely wonderful and deeply moving for both of us." The couple said the baby had been nicknamed JJ early on in the pregnancy, but are yet to decide what his full name will be. Dr Rashbrook is not the first woman in her 60s to become a new mother. 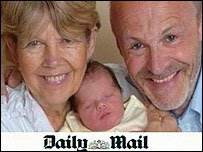 Liz Buttle, from Wales, was 60 years old when she gave birth to a son, Joseph, in 1997. The oldest woman in the world to give birth is thought to be Adriana Iliescu, from Romania, who had a daughter called Eliza Maria in January last year at the age of 66.